Beginning today, my state aims to execute 7 inmates over the span of 11 days. The reason for this flurry of state-sponsored killings is quite easy to discern, our lethal injection pharmaceuticals are expiring. 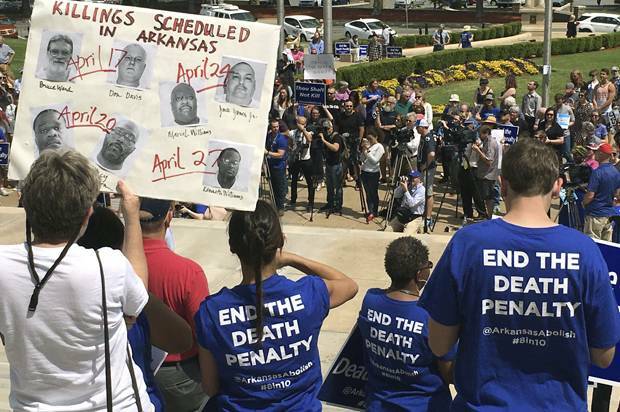 It's an asinine reason for conducting an asinine activity...but apparently Arkansas has a previous history of multiple executions. This event is so spectacularly audacious that we've received substantial attention from national news networks. Currently, the executions have been halted (perhaps only temporarily) by both state and federal court orders. I'll quickly summarize why capital punishment is arcane and ineffective. It is not a deterrent. "Common sense" dictates that harsher punishments deter people from committing said crime but alas "common sense" is wrong. This logic of deterrence is a fallacy. Malcolm Gladwell highlights this notion in his book David and Goliath by citing the origination of this philosophy, it's implementation, it's inability to manifest change and the more appropriate counter philosophy. Speaking of capital punishment specifically, there is significant evidence from several sources to indicate that state-sponsored murder does not curtail murder within the community. (1), (2), (3) and (4). It is not fiscally responsible. Estimates indicate the cost of executions may exceed $1 million while life imprisonment costs over $500,000 or to put it differently, execution cases cost ~4 times as much as non-death penalty cases. Despite varying in the exact costs (which differ based on the state), the consensus is that executing people is more expensive. (1) and (2). Statistically those who most favor the death penalty identify as Republican. Another tenet strongly routed in the GOP base is the idea of 'fiscal responsibility'. Logic would dictate it would be irrational to favor both beliefs simultaneously. It is immoral based on theological doctrine. Christianity is the majority religion in this country so for brevity sake, I will be citing from a Christian worldview. While the Old Testament is often a source of scripture favoring capital punishment, Jesus himself brought forth the New Testament, which is inundated with views against violence and execution. The New Testament canonizes compassion for all, even one's enemies (turn the other cheek, swords becoming plowshares, etc). Furthermore the New Testament describes the public execution of the Christian Messiah which should incentivize Christians to abstain from participating in the same ritual that killed the Son of God. If you're still adherent to primarily Old Testament scripture then one could cite the commandment that 'Thou shalt not kill' as primary evidence for moral objection to executions. As a community we are all culpable in government execution. Researchers from two Michigan universities collaborated on a comprehensive publication to discern the rate of wrongful executions. Their conservative estimation of the rate of innocent people being executed was 4.1% or 1 in 25. I don't know about everyone but anything greater than zero seems like a lot to me considering the gravity of the subject. While execution in and of itself is wrong, executing innocent citizens is on another level of immorality. During the recent legislative session in my state, an Arkansas state representative crafted a bill to eliminate capital punishment from Arkansas's criminal justice registry. I asked my designated congressman to support the bill and the conversation between us was a bit absurd to me. I plan to post details on that interaction in the near future. For now however, I'll let you stew in these ideological juices while I fervently watch the news and hope that the current court rulings stand long enough to prevent my state from murdering 7 men. It [capital punishment] does not render justice to the victims, but rather fosters vengeance. Give them [criminals] some form of punishment to say they were wrong, but show them they are part of society and can change. Show them compassion.